Happy Sunday. Hope the week end is going great for all of you. I decided to go out and re do my outdoor deck the other day. 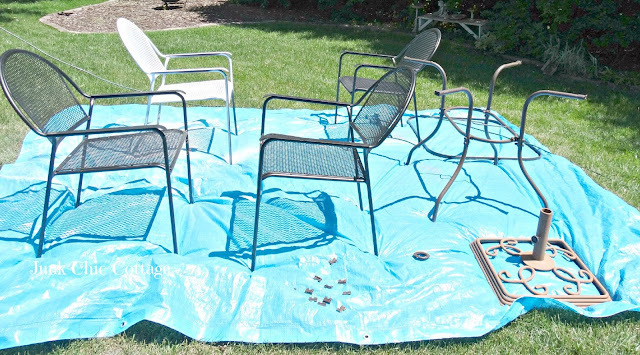 I wanted Terry to paint my table and chair set and I took everything off the deck to power wash and re arrange things. My poor plants have taken a real beating this summer. 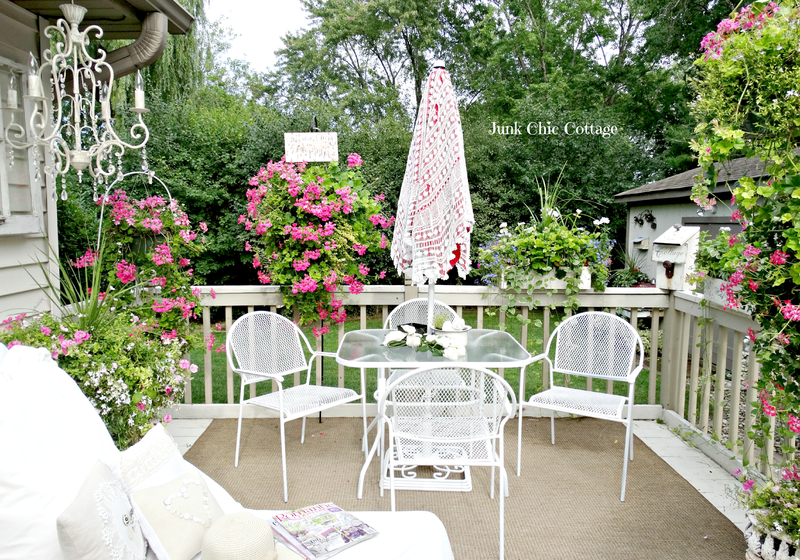 I had a lot of hanging geraniums and they love sun and heat and like it on the dry side. Well our whole month of June was cooler temps and it rained almost every day. I thought I would move them around and try to nurse them back. Well that just started a whole thing! I decided to take everything off the deck and power wash it and start to rearrange things as I put them back including the hanging baskets. 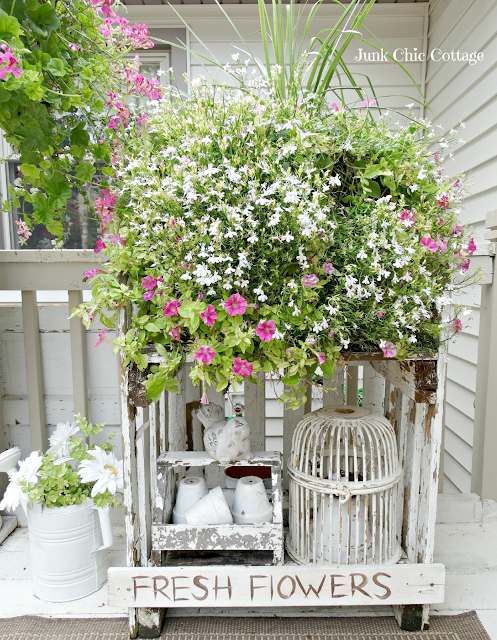 Normally these hanging geraniums would be to the ground and so lush and full. With all the rain they are very thinned out and not growing much. I moved my lounger back onto the deck first. I moved it from the corner of the deck to under the potting shed sign. I also hung back up a chandelier for night time. Most of you that know me know I love to take the unusual and put them into my garden. I had this white vintage birdcage holder so I hung one of the ivy geraniums in it for a little whimsy. I love my lounger for reading on a nice summer day. Ok you got a sneak peak at the newly painted table and chairs. Here is the set painted white. I love the lighter fresh look it gives to the deck. Now I need some cute cushions. Great for dining El Fresco. This really shows the hanging ivy geraniums so thin and scraggly. They normally are very full and lush. They just had too many days of rain last month. So now that we are getting heat and sun I am hoping with some TLC I can get them back on track. I planted one of my baskets down into this vintage fire place log holder. Just another unusual use of something for my plants in the garden. Love the chippy legs on this cast iron log holder. All my baskets with petunia's are holding up pretty good to all the rain we had. They love it hot and sunshine too but they can take the rain. So just moving the plants around and rearranging and painting the furniture makes the deck feel brighter. Have a wonderful start to the new week ahead. 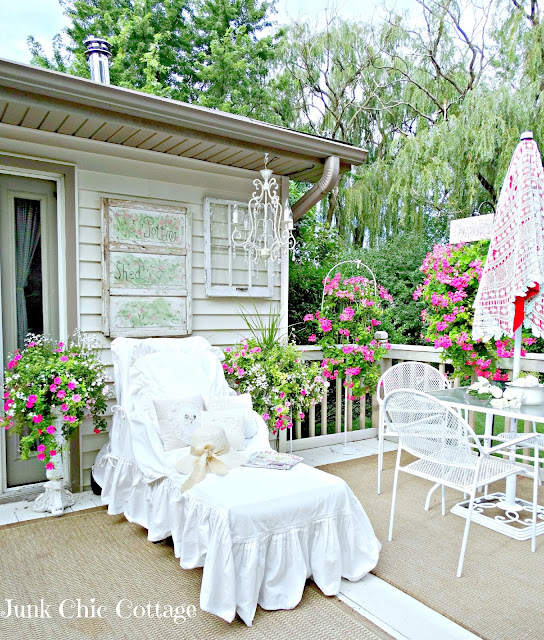 I like the set painted white, it fits in perfectly and looks fantastic on the deck. I love my paint sprayer too, there's no other way to paint. Oh Kris, I love your space....first of all, my petunias, that are sunlovers as we all know, are not doing well. I think they too got hit too much from the rain we've had...so that answers the conundrum over here. Secondly, YOUR WHITE SPACE....love your chaise. I have one but have nowhere to put it. I did use it once for a photo shoot in my yard, and if just for that purpose, I'm keeping it! Secondly, I got those sterling silver knives with the mother of pearl handles AND a vintage French enamel white pitcher! FUN! What a great deal. I painted two outdoor chairs last summer and it was not easy. Your set looks great and so do the geraniums. They would never look so lush and full in Texas. Too hot and too dry. I hope they come back for you. Have a great Sunday. That set looks amazing painted white. Everything is gorgeous, would love to hang out here!!! Kris your deck is just gorgeous - truly ! Lookin' good! Your plants are gorgeous even with all the rain you've been getting. I can't believe how naked your deck looked without all your gorgeous plants and furniture. I love your deck and that lounger is so inviting. Kris, I don't know if it's just the way you cleaned, painted, and added your vintage touches or what, but I think your plants still look really good. That space looks like it gives a total zen feeling, even if all you do is walk out there, let alone relax to read and/or dine. Really nice. I'm surprised the table/chairs even lasted one summer as black - it looks greats in white. Love the log holder and bird cage too. I hope you & Terry enjoy the rest of your summer days out there - relaxing, not working! So pretty. I really love your lounge chair cover. Well, I love it all!!! I love this space, Kris. your flower baskets look wonderful, I just can't grow them like you do. that dining set from Walmart is adorable. what a deal! Gorgeous!!!! Your table and chairs are so pretty and I love the umbrella!!!! Your deck looks very inviting and the table looks great too! It is beautiful. I love the umbrella. Where did you find the umbrella? It all looks just lovely! You've created the perfect dining/relaxing spot on your deck, Kris. I think your plants look fine with all the rain and cool weather they endured. Now that the sun is shining down on them, I'm sure they'll grow to the ground in no time at all! What a sweet deal on the dining set! Your deck is such a beautiful oasis, Kris!! 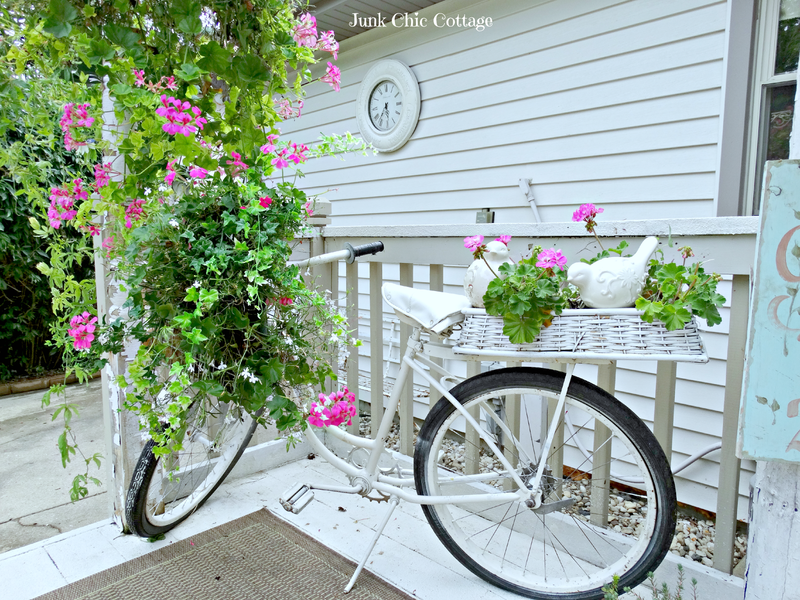 Even though your hanging baskets have taken a beating, they look so pretty. Love the addition of the table and chairs. It looks wonderful, as always. It's funny how doing one thing can start an avalanche of other projects. I've been doing that a bit myself today! What a lovely place to sit and read or eat breakfast. Love the white table and chairs. 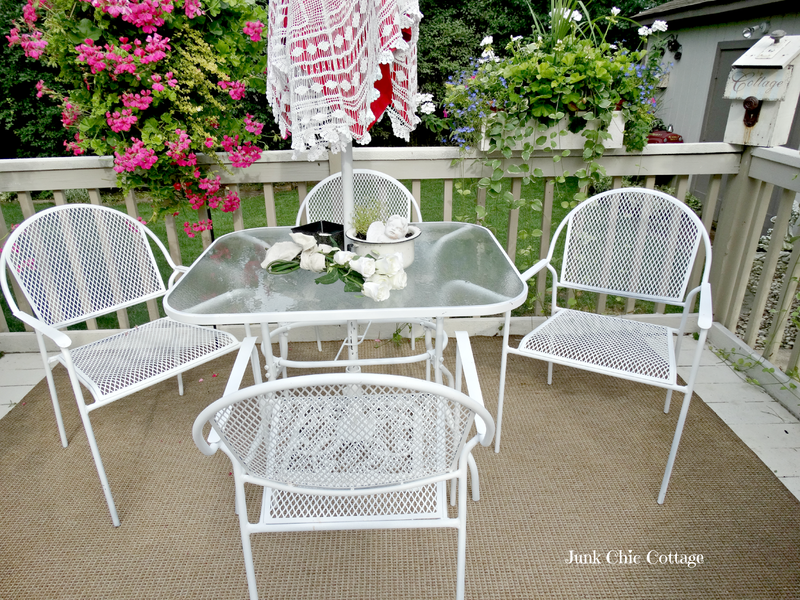 The table and chairs look perfect now, Kris...and it really does have a bright and fresh look on the deck! what a beautiful relaxing spot. I love what all you have done. Great job. Nummy! Deliciously fresh and crisp like raspberry syrup on ice-cream. Beautiful place to lounge and eat. You deck and baskets are luvly Kris. Shh... somewhere in Geranium Land is a wanted poster with my picture on it for the murder of many of their kin. I pled accidental death... but to no avail. Just too hot and wet here in NC Florida. So very you my dear... And who would have thought Walmart your patio set looks a million times better after its paint finish. I can just see you relaxing under the summer nights stars... If it were mine I would move my extra spare Iron bed out there fully dressed for some summer nights sleeping under the stars watching a favorite movie. Love your crisp white style. You flowers are lovely...envy your rain here in California. The new saying going around here is "brown is the new green". This is in reverence to our lawns. It could be worse than brown lawns. The orchards and other agricultural residents have starting tapping into the ground water so deeply that many residents that are on well water no longer have anything to tap. It is such a shame. Enjoy your summer days while you have them. I am too making the best with what I have and enjoying the sun shine. Your surroundings both inside and out always look so lush. Love the table and chairs in white! It's such a cozy spot to sit and relax, Kris. 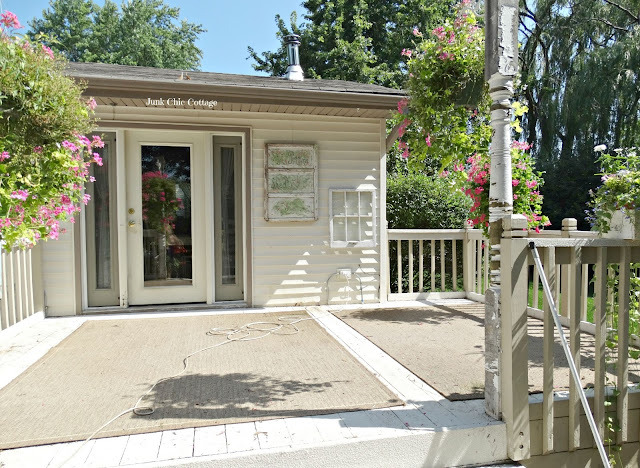 Your flowers still look great and your lawn is beautifully green. 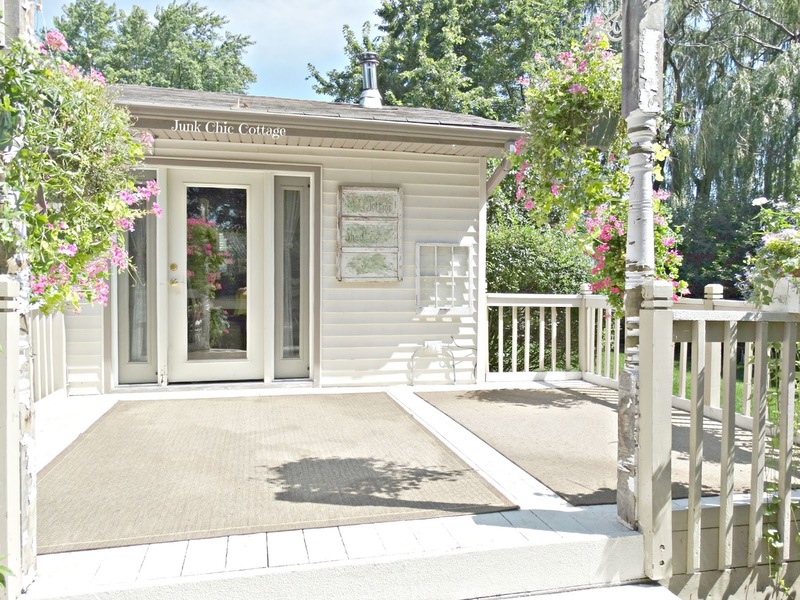 Enjoy your pretty deck and the view into your lovely garden! Well I think your deck is just gorgeous! I would not know your plants are not doing well, they look so pretty. Love your table and chairs painted white, what a great deal you got on them. They almost look vintage, I see alot of vintage sets in that pretty metal design. Enjoy your fabulous space!!! What a gorgeous outdoor room, Kris!! The table and chairs look great painted white. I love the way you incorporate your pieces into planters for outdoor gardening. Looks like a wonderful place to just sit and relax, and enjoy the summer. This is so beautiful, Kris! I love the cast iron wood holder. It must have been a lot of work to take everything off and clean well, right in the middle of summer, but what a fresh clean look you have now! you say that your flowers look thin and scraggly, but to me they look beautiful and lush! Mine never look like yours on their best day! LOL! I love your table and chair set painted white. It's the perfect size out there. Mine needs repainting too. Maybe we can do that this Fall. Your summer has been very different from ours. Ours has been hotter than usual with very little rain. Most days are in the 90's with thick humid air making it too uncomfortable to sit outside very long. I think that's why I'm ready tor Fall to get here so bad. August is our hottest month too, so I'll be glad when it's over. Beautiful Kris. 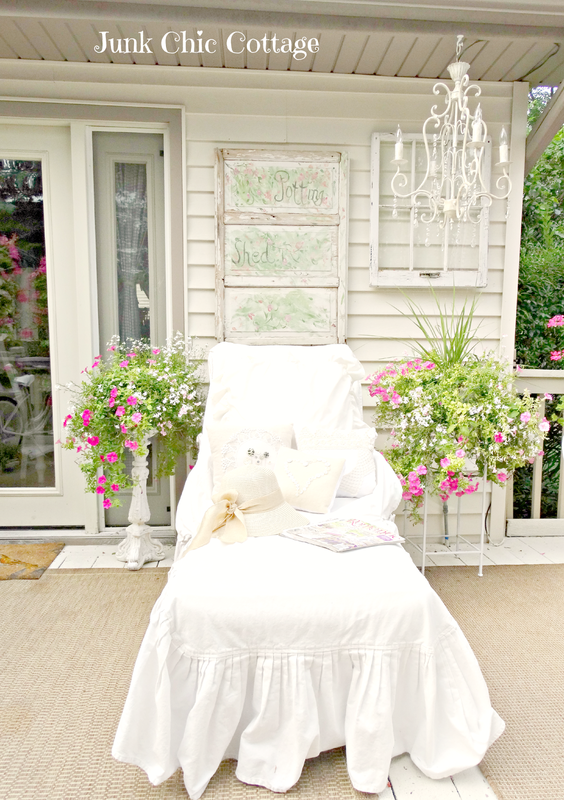 I could just relax there all day, surrounded by the flowers and your very creative touches! Your plants have to much water and ours don't have enough- wish we could reach a happy medium? 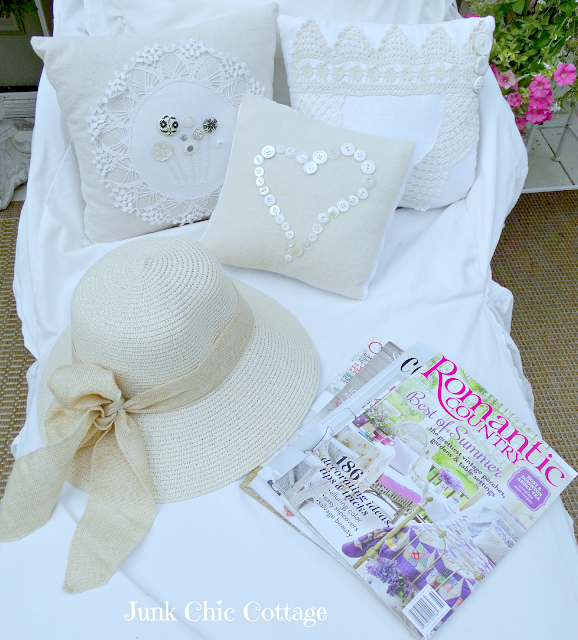 I just decided that I am going to go sit in the garden on my "junk chic cottage" inspired chaise to finish my blog browsing. I love the lounger and chandelier. It looks comfy!! One thing always leads to another...LOL. I think it all looks so beautiful and from the photos, the flowers look gorgeous and not scraggly at all! Happy Monday! I agree with Benita... your flowers look really pretty and I love how you rearranged everything. That log holder is amazing! Kris, what you call straggly still look gorgeous! But I do know how your plants are usually touching the ground by now. Love the set painted white, and what a bargain! With the umbrella even? It looks quite unique also. I got a small round table like your chairs at a thrift last week for $15. I'm going to give it a new coat of white paint. It will be great for extra seating. Love all of your unusual containers! Ooo....I just barely noticed that FABULOUS laced umbrella! SUPER! This deck is magazine worthy. Love the trio of white pillows. Looks great! Love the umbrella! Your hanging plants look great! They must be a wow when full and lush. 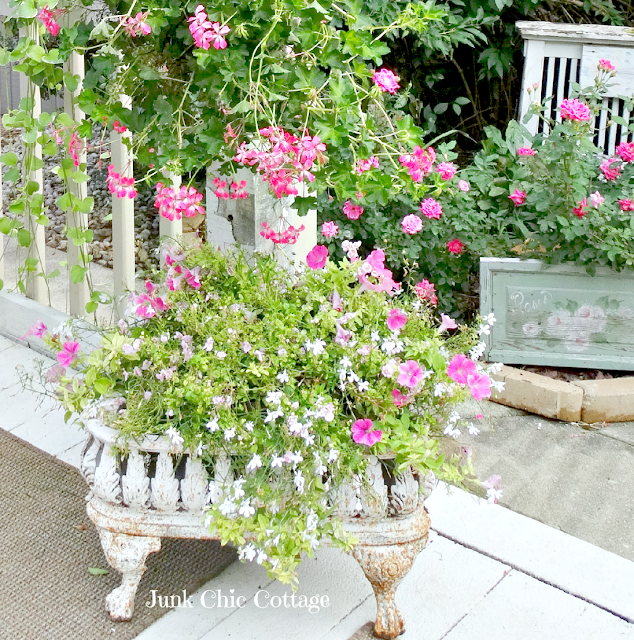 I just bought a pink ivy geranium to hang off my side porch. They are say "summertime!" White paint always makes a huge statement.....your whole deck looks so pretty and inviting. Oh my Kris your deck looks so inviting! Happy to see the chandelier back again - I just love that feature. 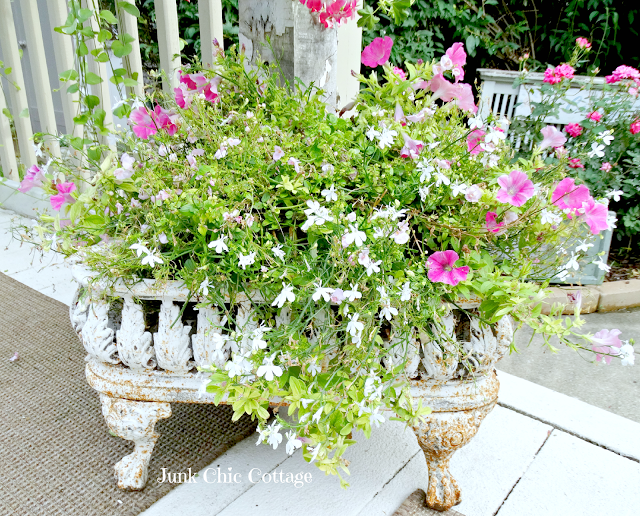 Swooning over your vintage firelog holder turned flower box - so pretty! We had drought and Hot here in Northern Michigan until last Sundays Storms, my Geraniums just did not do well this year either. Just wondering did your husband get the job offer? Kris, It looks absolutely fantastic out there. Your plants look a whole lot better than mine do. I left MyHero in charge of watering them while I was at my daughter's. I guess he likes the color DEAD because there is not hope for my THREE BIGGEST BEST BASKETS! Geez! Anyway, with your green thumb you will get them all back and, the truth is, they don't look bad at all just like they are. ps. I have two old fireplace grates/log holders as plant holders, too-on my porch. I ended up putting those rubber "feet" thing under mine because they were leaving rusty stains on my concrete. Well, I think your plants are gorgeous and not scraggly! I can show you scraggly!!! 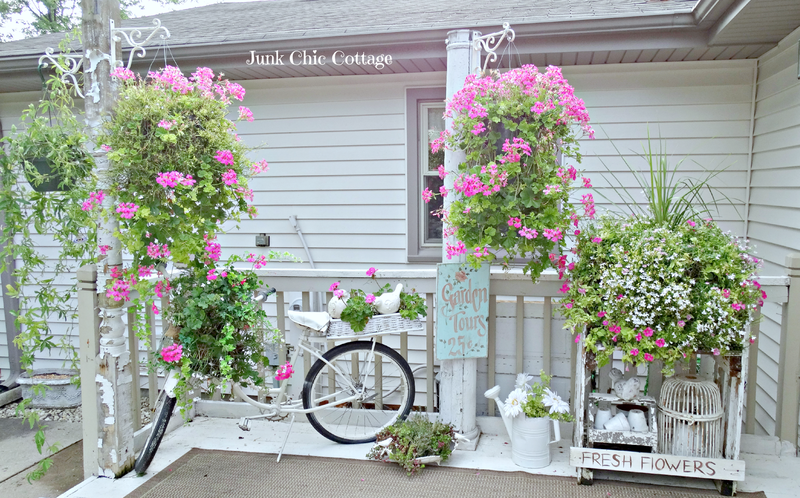 :) What a most beautiful porch to spend time relaxing and having a great meal surrounded by beauty everywhere!...Love all of your most creative ways that you hang and plant your flowers. As I have stated before, no moss grows under your feet! It's looks so lovely Kris! 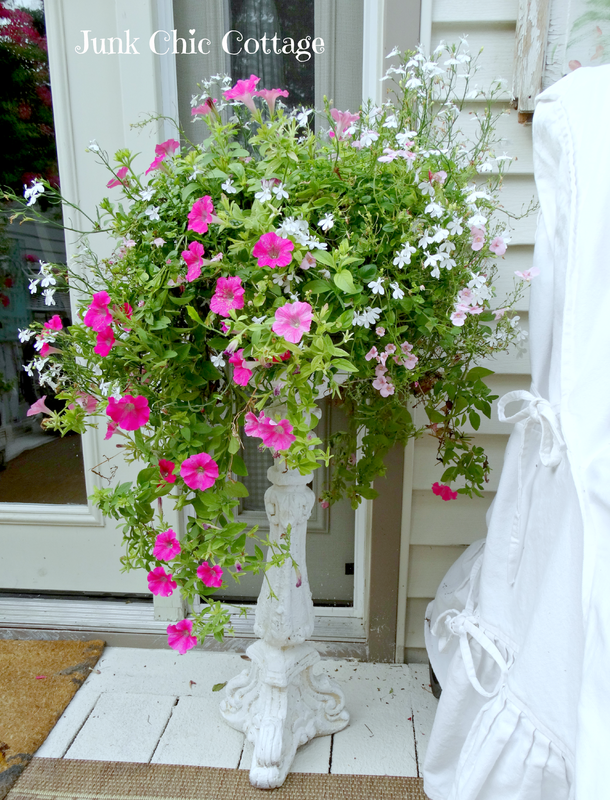 Love all the planters, and your geraniums look really good considering the weather you've had. It's amazing how that set was totally transformed with the white. Just gorgeous! Love that log holder thingy. It's so dry here, our plants are struggling....I'm watering twice a day and they still have droopy heads. What a beautiful setting! I could curl up on that lounger and take a nap. Your geraniums look terrific. I'm in TX and the recent heat has my geraniums looking pretty sad. Your photos remind me that I want to try the scented hanging geraniums next season. Your deck looks so pretty especially with the newly painted patio set. The lounger has got to be the prettiest one I have ever seen! 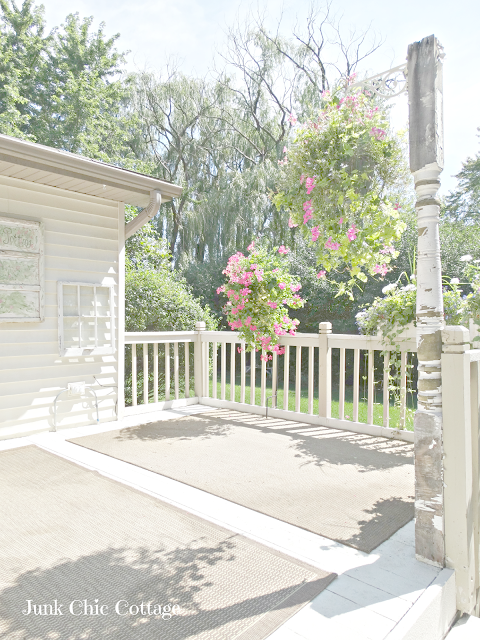 This deck space is delightful.. I could spend my days enjoying this space for sure.. great job with colors too! Wow wow WOW! You have one of the prettiest decks I've ever seen. I swear my taste is just like yours….love the vintage log holder planter best of all. How great is that! I'd spend all my time outside if I were you. I love the painted dining set, too. LOVE the white! Oh my goodness I had to laugh at your complaints about your plants, Kris. looking pretty good this year until I saw yours. The whole deck is lovely. I bet you really enjoy lounging there. It's all so beautiful, oh my gosh...I love it all! I hear you on the Illinois summer we've been having...no rain lately = plants that are not doing so good anymore! I just redid my pots out front with tropical plants, since the past few weeks have been so tropical here! I must say though, your plants look amazing! That Wal Mart set looks nothing like it did before, it's amazing white! I just love the chandelier and I bet it is all beautiful at night! 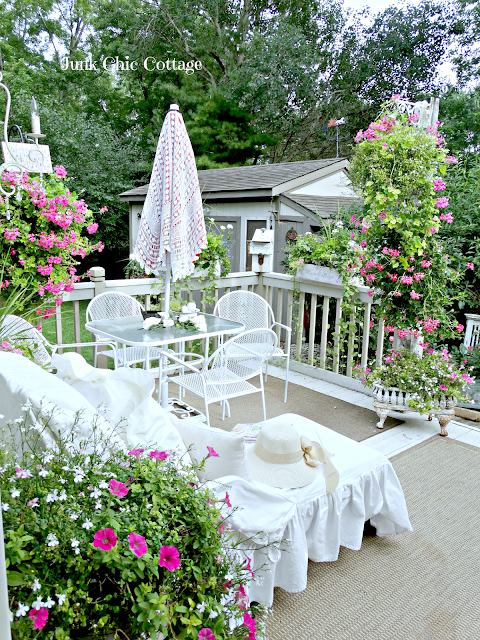 Your deck looks great and it's the perfect place to spend a summer afternoon... Maybe it's beacuse Brittany is very rainy, but my geranium never look very lush, so yours looks amazing to me! Kris, Your deck looks amazing. 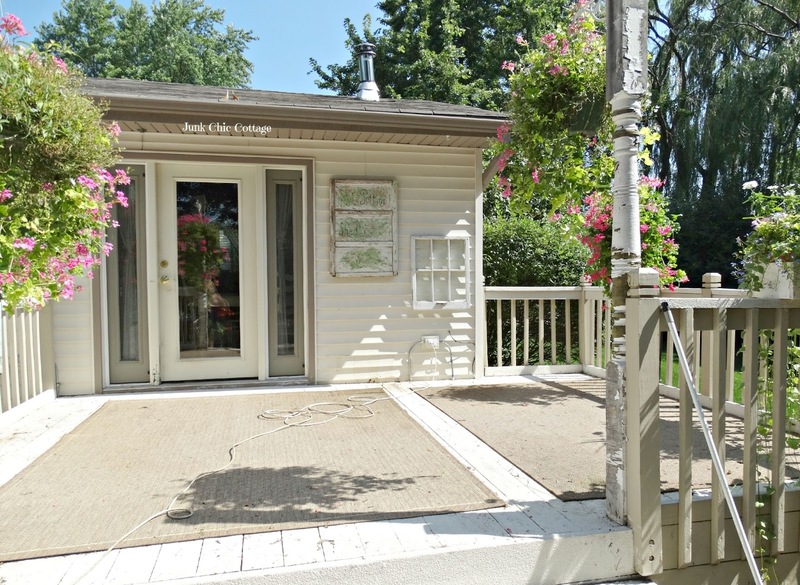 What a beautiful spot to relax and enjoy your garden. Love the table and chairs painted white! Thanks so much for sharing at Simple & Sweet Fridays. Your deck always looks so lovely and inviting Kris and I think the table painted white is a perfect addition to this mini make-over. I look forward to featuring this at Shabbilicious Friday tomorrow. Ordinary Day... Treasure Box Arrival!!! !